Home » thedermatologygroup.com » Are local nail salons losing safety for style ? Safety first. The Skin Cancer Foundation released a statement in 2013 that said, "Research has shown that ultraviolet (UV) radiation-emitting devices are carcinogenic to humans. 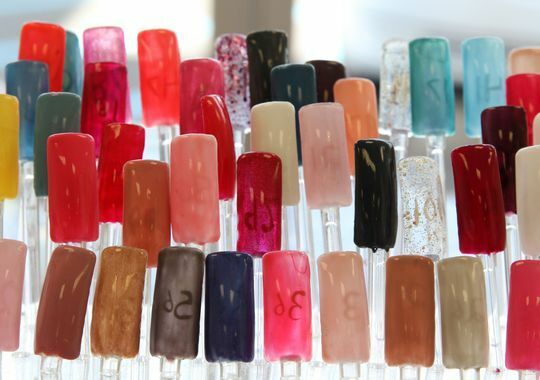 Although studies have shown that the skin cancer risk associated with UVR-emitting nail lamps for gel manicures is very low, it is not insignificant." David Davidson, president of the New Jersey Dermatology Physician Assistant Society, who’s also been a physician assistant for 15 years at the Dermatology Group in Freehold, said over time, gel manicures can have harmful effects. "There’s all different manufacturers of UV light some are stronger, some are weaker, but with UV damage it’s cumulative," Davidson said. "Even if you’re only putting your hand under for 30 seconds or a minute, most people are going every two weeks. Multiply every two weeks by five years, you’re getting tremendous UV damage." Davidson added that UV damage can cause brown spots, early signs of aging and skin cancer. He recommends putting on an SPF 30 sunblock 30 minutes before getting a gel manicure or seek out LED light, which does not have harmful effects. If the light feels too hot, he suggests taking your hands out for a few minutes to prevent damage. We decided to talk to the top nail salons at the Jersey Shore, many of which are moving toward safer practices, to get their take on the matter. Serrantonio who spent 20 years of her life working as a stay at home mother, decided to open her own nail salon, Cathy’s Nice Nails & Hair, 93 S Main St. in Farmingdale, six years ago. As someone who’s always loved getting her nails dolled up, Serrantonio realized there were not many services available for women in the area after she moved from New York. "It was my dream," Serrantonio said. "My husband said to me, ‘Why don’t you do it?’ I decided to give it a whirl." She’s built her business model centered around budget-friendly services. Her salon is home to the $20 pedicure. Serrantonio said many women do not have time to come in for weekly appointments, and as a result they are looking to use CND Shellac gel polish. Cathy’s Nice Nails & Hair uses UV light to cure the gel polish so that you can leave the salon with perfectly dry nails. Serrantonio is aware of the studies that suggest UV exposure can cause skin damage and skin cancer, and she said she believes they’re an overreaction. "It’s not any worse than walking outside and going out into the sun," Serrantonio said. "The length of time the client is under that light, it can’t possibly do damage and it’s only your fingertips. As long as you’re using top of the line products, top of the line light, I really can’t see the hysteria about it." Removing the gel takes about five minutes, Cathy’s Nice Nails and Hair places acetone on a cotton ball, which then gets applied to the nails and the nails are then wrapped in tin foil. Serrantonio said the gel can then be reapplied or the client can go back to regular nail polish. She said acrylic nails, on the other hand, do damage the nails. Acrylic nails are a fake nail enhancement that uses powder and liquid. Most clients are straying away from this old trend, Serrantonio added. She said acrylic requires using a drill, which takes off the natural layer of your nails, weakening them. "We honestly don’t do too much of it because it’s extremely time consuming and more and more girls are going to Shellac manicures because it’s all about short natural nails. If you look at the stars, they all have short natural nails," Serrantonio said. The Derm group leads charge as montclair is named sunsmartest town in America. Dr. Danny Groisser, Founder and Medical Director of The Dermatology Group, and President of LiveSunSmart, the non-profit organization dedicated to teaching young people how to live “sun smart” active lives, spoke at the recent ribbon cutting ceremony where Montclair was unveiled as the country’s first SUN SMART CITY. Dr. Boris Leshniak, Deputy Surgeon General of the United States also gave remarks, as did Robert Jackson, the Mayor of Montclair. Montclair’s Chief of Police was on hand, as was the entire Town Council to mark this historic event. Even the Boy Scouts lent a hand to plant a sapling, which will of course, eventually become a shade tree. Teri Festa, the event’s organizer and LiveSunSmart’s founder, created a meaningful legacy that will undoubtedly impact future generations. Dr. Groisser reminded everyone that yearly skin exams are very easy, routine exams that can be potentially life saving. “Everyone knows the importance of mammograms and colonoscopies; regular skin exams by a board-certified dermatologist are just as critical,” he noted. The Dermatology Group donated $5000 to create a shade structure in Montclair, potentially in conjunction with students’ team venues. Movin’ on up…or in this case, movin’ on over to the other side of Route 17. Our Paramus office is now located right across Route 17, at 30 West Century Road, right next to the Inspection Station. What do we offer in Paramus? Call us at 973-571-2121 for more information or to schedule an appointment. Time to Ditch your turtleneck ... spring is really going to come. Have you ever looked in the mirror and seen a neck that is shockingly that of a much older person? (We have, and trust us, it’s a bit alarming.) GOOD NEWS. The Derm Group now offers a groundbreaking new treatment – SCITON SKINTYTE – which can literally zap that neck back into shape. Here’s the fine print, and a $400 offer! -One session is $400. A series of four is recommended for optimal results. If you pre-pay between now and April 30th, the fourth treatment is on us! (Pay only $1200, not $1600). -It does not hurt, though you do feel the treatment. It delivers heat deep within the dermis to tighten and create collagen, but keeps the skin cool and comfortable. SKINTYTE – FEATURED ON “THE DOCTORS” – watch for the dramatic reveal! UPDATE: ALL LOCATIONS OF THE DERMATOLOGY GROUP WILL BE CLOSED ON TUESDAY, JANUARY 27, AND CLOSING AT 4:00PM ON MONDAY, JANUARY 26. IF YOU HAVE AN APPOINTMENT DURING THOSE TIMES, OUR REPRESENTATIVES WILL BE CONTACTING YOU TO RE-SCHEDULE. YOU CAN ALSO VISIT OUR CONVENIENT PATIENT PORTAL TO RE-SCHEDULE. (Click the “Make an Appointment” gold bar on our home page). STAY SAFE DURING THE STORM! Please be advised that all locations of The Dermatology Group will have delayed openings on Tuesday, January 27th. If you have a morning appointment on Tuesday that is currently scheduled before the delayed opening time, one of our representatives will be contacting you to reschedule your appointment. If you do not hear from one of our representatives, that means your appointment is not affected. At this time, all locations (with the exception of Jersey City, which will be closed) will have late starts on Tuesday. If there are further updates, we will post them here. If you have any questions or concerns, please call us at 973-571-2121. Additionally, please log in to our convenient PATIENT PORTAL (click the gold “Schedule An Appointment” bar on our homepage). You can easily see your medical record, make or cancel appointments, request prescription refills, pay your balance, and send your provider secure questions or messages. Above all, please stay SAFE throughout the storm!